This post wraps up another ego-fueled year of blogging for me, and I just wanted to pass on thanks to the people who stop by to check out the music and products that I find interesting! 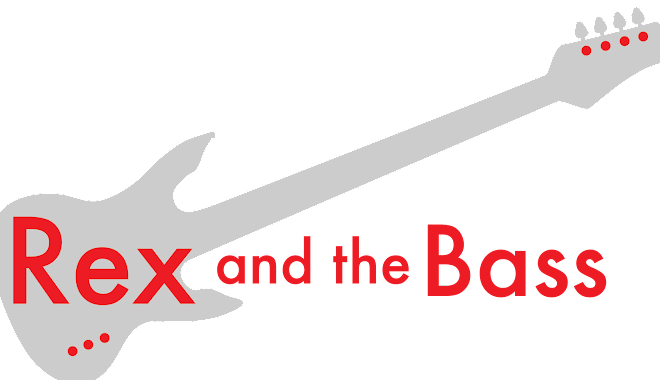 Rex and the Bass has reached the milestone of ¼ million hits after only 2 ½ years, and I am quite frankly stunned that it has become this popular. A neat byproduct of the blog is that it has led to other writing assignments, most notably a steady gig with Blues Blast Magazine. Three years ago I would never imagined that I would have a blog, nor any of the other cool stuff that is going on in my writing world. I find that I am picking up the laptop more often than I am playing my guitars, and am unsure about how I feel about this -- but for now I will keep plodding ahead. I have said all along that I would only keep up the blog as long as it was fun, and since it still interests me I am going to be here for a while longer. If you have any subject ideas or products you want me to check out, send me a message and I will get back to you promptly. But in the meantime, thanks again for your continued support, and I hope you can stop by regularly! When I was putting together our season ticket package for the Pantages Theatre this year, I snickered a little to myself when I saw that Donny and Marie were on the list, but went ahead and checked the box for their show anyway. On the surface of things, it seems like a hokey show, but they are legendary entertainers, and I have never had the opportunity to see them live before. Plus, I love Christmas music! And it turns out that going to see them was a great choice, as their show was exceedingly amusing (in a good way). 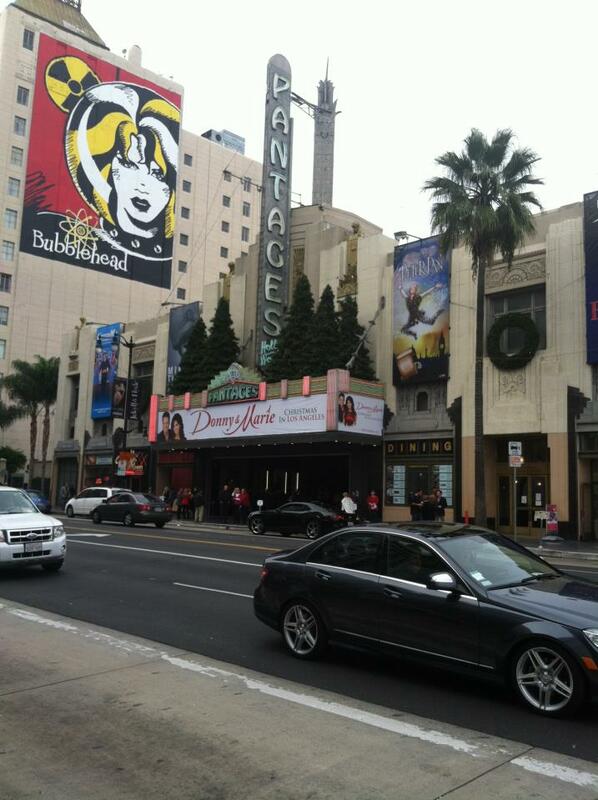 For starters, the Pantages is always a great place to see a show. 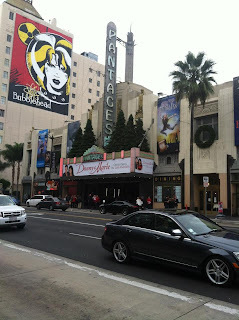 Parking is easy (easy for Hollywood, anyway), and it is a beautifully restored Art Deco theatre. The theatre is laid out well, and there are really not any bad seats in the house. This show drew scads of old people, so getting around was maddeningly slow, but I guess that was ok for the majority of the people that were there. This probably accounts for the two extra speaker arrays they installed for this show, too. The doors did not open until a few minutes before showtime, so it was hard to get all of those slow-moving old folks seated, making the curtain rise about fifteen minutes late. But from there they got into the groove and did not miss a cue for the rest of the event. Overall, this show appears to be their regular act with a generous dose of Christmas shtick thrown in for the season. 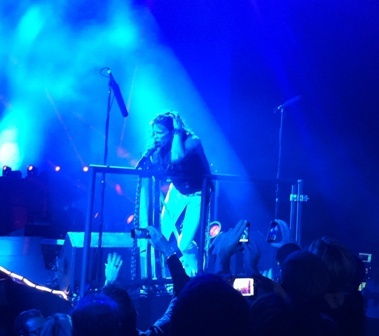 The stage was set up with movable staircases that were re-arranged throughout the show. An enormous Christmas tree and some poinsettia plants were included as a concession to the holidays. A video screen across the back of the stage played a combination of vintage Osmond footage and close-ups of Donny and Marie as they were performing. There were also eight dancers for this production (four male and four female), and they were very capable and were graced with slick choreography throughout. They had plenty of costume changes, though they did not have nearly as many outfits or shoes as Marie. So, everything was set up for this to be a stellar production, and Donny and Marie also did their part to make it happen. They are epic performers, having done countless Broadway and stage shows over the past 40 years. Marie is still the better singer, and her voice seems to have even more range and strength than when she was younger. She is a good dancer, having reached the finals of Dancing with the Stars a few years back. Donny’s voice is still good, and he is the better dancer of the two, which he reminded Marie of many times during the show. He went home with the DTWS trophy, you know. Donny and Marie both have an incredible stage presence, and they bantered and joked with each other quite a bit. There were a lot of their old favorites thrown in, with lots of neat old footage on the video screen. 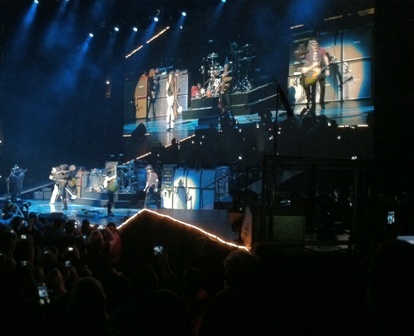 They even did a “Little Bit Country/Little Bit Rock and Roll” segment for their die-hard fans. And the fans must have been pleased that they came down into the audience a few times, and even brought a couple of fans up on stage. It was a hoot! All in all it was a fabulous show, and it was well worth the money and the trouble of heading up to Hollywood. Donny and Marie will be doing this show in Salt Lake City for a few weeks, and then are heading over to London at the end of January. When they make it around to your town, whatever show they are doing, I heartily recommend that you go check them out. Perhaps you are scrolling through your iTunes, and you are not seeing any new or interesting. 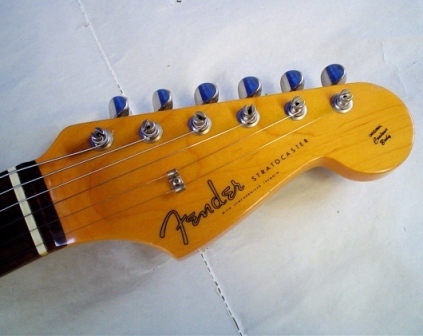 Boy do I have a suggestion for you: Bromberg Plays Hendrix. It might just blow your mind. Brian Bromberg is a veteran jazz and fusion bass player, and is certainly one of the more adventurous ones out there. 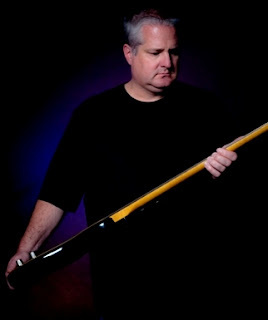 He is not afraid to do something different, so you get projects like Bromberg Plays Hendrix. This is not just a guy playing bass solos on each song. For fifty minutes he performs all of the guitar and bass parts with his bass guitars, with plenty of liberties taken, none of which make the source material any easier to play. So, he uses his prodigious talent to mimic the Hendrix’s guitars and vocals, using electric, acoustic and piccolo basses, along with what must be a mountain of effects (including a wah pedal). Of course he plays the bass parts too, and stays perfectly in sync with the powerfully gnarly drummer, Vinnie Colaiuta, who does a great job of holding things together. I am not sure who gets vocal credit, but any of the words are secondary to what Bromberg and Colaiuta are doing up front. Brian has chose ten songs that any true Hendrix fan will approve of: “Fire,” “Manic Depression,” “Freedom,” “The Wind Cries Mary,” “All Along the Watchtower,” “Foxy Lady,” “Hey Joe,” “Crosstown Traffic,” “Spanish Castle Magic,” and “Purple Haze.” Whew! And Hendrix fans will find that Bromberg interprets the music in his own way, but is still respectful of the source material. It is amazing how well he performs the guitar parts, though I do find the whole experience to be rather intense. I usually can only listen to one or two songs before I feel the need to move along and do something else so my brain can take a rest. 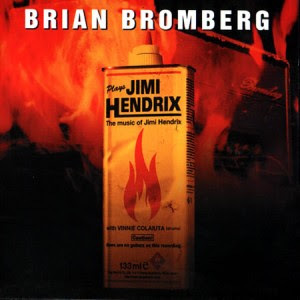 So, if you are a die-hard Hendrix fan or a complete bass geek, Bromberg Plays Hendrix will be right up your alley. I do recommend trying before you buy, as this album will not be everybody’s cup of tea. And Brian is not done yet -- just wait until I review Bromberg Plays the Beatles! 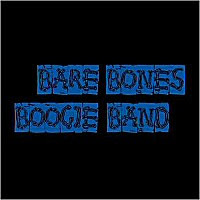 I have the good fortune to listen to blues CDs from all over the world, and this week I had the pleasure of hearing the latest release from London’s Bare Bones Boogie Band. And true to their name, this foursome plays a stripped-down no-nonsense power blues that is held together by their prodigious talent. Vocalist Helen Turner has worked with guitarist (and fellow Scot) Iain Black since 1990, and Trev Turley from Birmingham joined them on bass in 2003. The Bare Bones Boogie Band came together as a whole in 2008 when Andy Jones, a drummer from Manchester, came into the fold. In 2010 they gave us their well-reviewed eponymous debut CD and supported it with endless touring. This is a review of their second CD, which is also self-titled, but it is being called the “Blue CD” because the logo is blue, differentiating it from their first release that had a red logo. In their catalog they refer to it as “BBBBCD2.” The Blue CD sounds a bit better, doesn’t it? This album includes ten tracks: eight of which were written by Black, one from Andy Jones, and a touching cover of Robert Johnson's "Love In Vain.” You will find that all of the touring they did has been put to good use, as all four members of the band are in top form for this project. “Fallin’ for Foolin’” is the first track on the Blue CD, and the listener will find that although these four folks came from different parts of the UK, there is no Scottish or English accent or tone to the music, it is just the blues. This is a long and slow song for an opener (almost seven minutes), but it is cleverly-written and well-produced with up front guitar, drums and bass and of course Helen Turner’s vocals. Everybody has a chance to show what they can do on this track, and Helen really stands out: her vocal style is brilliant and shows that she has learned a lot about her craft over the past few decades. The next two tracks “Midnight O2” and “Sittin’ Here Sewin’” evoke a 1970s blues/rock mood with round and lively bass lines and fat guitar over the tight drumming of Jones. But there is plenty of variety to be found on this album as it segues into a lovely ballad, “Mean Old Man,” which is not a conventional love story. This song shows tremendous restraint on the part of all that were involved, and there is just enough of a contribution from everybody to assemble a really good song, which is a sign of how this band has matured. One of my favorite tracks on this release is “Wings” which is a fabulous showcase of Helen Turner’s vocal range and the soul she puts into the music. These same qualities carry over to “Love in Vain” which was written by Robert Johnson, but made famous for us mainstream folks by the Rolling Stones. Her sweet voice helps the Bare Bones Boogie Band make this version their own. It appears that there is no shortage of soulful blues ballads on this album, which is a good thing in my book. After a couple of more blues rock tunes (“A Little Bit More” and “Travellin’ Light”), the band chose to close out the album with the end of the album with “My Man Loves my Van.” This is a fun beer joint 8-bar blues song that shows that the band does not feel like they have to take themselves too seriously. This is a fabulous quality in any band, if you ask me. The Bare Bones Boogie Band have avoided the sophomore jinx with their Blue CD, and I have to say that I think this work outshines their debut album in every way (by the way, I really like the Red CD). The whole production sounds more full and rich, and each of the artists have grown and improved on their performances since we last heard from them. This is helped along by the fact that the songwriting is much more consistent throughout this release. This is a great CD, and I highly recommend that you check it out when you get a chance. Today we are looking at a pretty cool Fender Stratocaster, a Japanese model ST-62-58US that I imported from overseas. 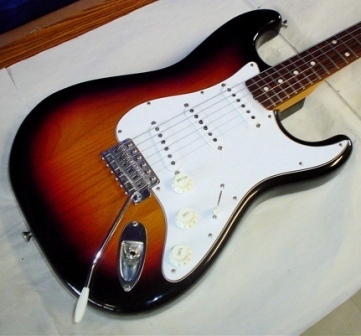 To decode the model code a bit, this is a 1962 re-issue strat equipped with US made pickups that originally sold for 58,000 Yen. From outside appearances, it is a very faithful recreation of the original. When this guitar was made in 2004, the Yen was around 106 to the dollar, which equals approximately $525, which was a heck of a deal back then for such a great guitar. 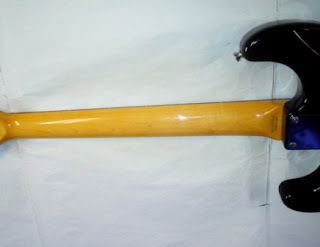 This one has a very nice three-tone sunburst over what looks like an alder body. The factory used a quality three-ply white pickguard, which is nice as often times these come with a garish red tortoiseshell guard. 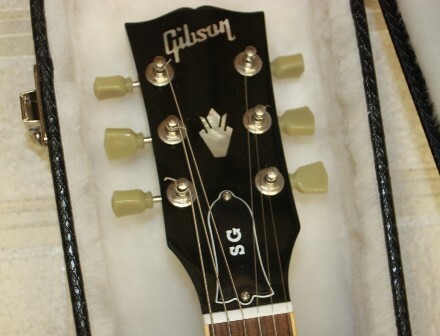 On the back, the cavity cover is single-ply white, which is how these came from the Japanese factory. 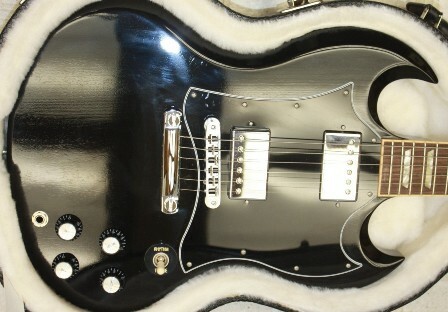 All of these features are nice, but the magic of this guitar is in its electronics. 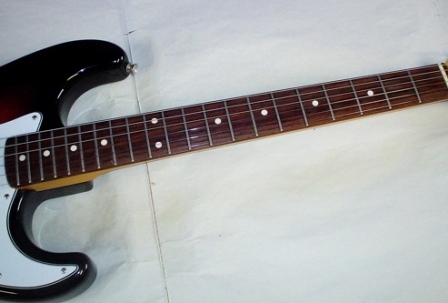 These USA made ST-Vintage pickups are super-hot, and this axe sings like few Stratocasters I have ever played. It has the total package of the right looks and the perfect tone! Like any of the Japanese-made Fender guitars, it is very well made, with level frets and good neck pocket clearance. Seven years later the finish still shines, though it has gotten a few nicks from normal playing. The frets and fretboard have some noticeable around the cowboy chords, but it has years to go before it needs any sort of attention. 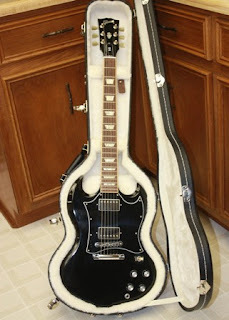 Add all of this up and you get a super instrument. I had it set up with .010s and this thing is easry to play and sounds terrific. Be sure to check out one of these Made in Japan Fenders sometime, and I am sure you will be surprised about how much guitar you can get for your money! The San Francisco Music Club is not just a clever band name; it really is like a club, with membership limited to only the most talented musicians. The club presidents are the veteran Bay Area guitarists/vocalists Jimmy Dillon and Lorin Rowan, formerly of The Edge (check their older material out out, if you get a chance). They are joined by Eric McCann on bass, Matt Willis on drums, horn players Michael Peloquin, Jeff Lewis, and Mike Rinta, as well as Sakai on vocals. It is like a super-group made up of people you have never heard of before. Love and Freedom is their self-produced debut release, and it is an ambitious and impressive piece of work that includes eleven original tracks, with Dillon and/or Rowan having a hand in all of them. The one cover tune has been reworked so extensively it might as well be an original too. Over these twelve tracks they managed to incorporate most every funky genre that is available in western music, including rock, funk, ska, reggae, Latin, Afro-Cuban and maybe even a touch of the blues. They did it all with excellent production values while maintaining a positive vibe, and I think this collection of songs will be sure to put a smile on your face. The first track is “Crazy Lovesick Blues” which shows how well Rowan and Dillon’s vocals work together. It sounds like there are five layers of guitars over the Afro-Cuban beat, but they are all tastefully done. Up next is “4 Winds” which would fit in well in a Jimmy Buffet album, with a laid-back countrified island beat overlaid with horns and a little acoustic guitar. Well, it might be a little too-well written for a Jimmy Buffet album. “Istanbul” takes a difference direction with smooth vocals and heavy guitars. This one brings in more keyboards, and there are a lot of funky (in a good way) harmonies on this tune. This song shows that these guys are not just good musicians, but they know their way around the studio too. This leads to an ode to Louisiana with “Ponchatrain,” which adds a harmonica, horns and a Zydeco taste to the poppy Caribbean beat which the San Francisco Music Club does best. Sakai adds her vocals to this song and her voice is beautiful, especially when she is harmonizing with the guys. Not surprisingly, “Revolutionary Man – Bob Marley Tribute” has a reggae beat, and after this song I can start to see the Marley influence in the rest of their music. The title of “Te Quiero” also gives a hint of its roots, but calling this Latin music just scratches its surface, as its Latin instrumentation is a foundation for a seriously jazzy tune. This is some really smooth stuff, my friends. The San Francisco Music Club chose to include a cover of one of my all-time favorite songs, “You’ve Lost That Lovin Feelin’” and has outdone my previous favorite cover version of this song that was done by The Firm. I got into an argument with a friend of mine as to whether this is a ska song or a reggae song, but I am writing the review so I am going to call this one a slow tempo ska tune. Either way, it is a winner and I love it when bands reinterpret classics like this into new genres. This CD ends with an acoustic reprise of “Love Can Be,” which I prefer to the pop/reggae/rock version that appears at number three in the batting order. This one is just lovely as it starts off with a harp and Jimmy and Lorin’s voices, later on weaving in some nicely-picked acoustic guitars and assorted strings. This song has such a positive message and a sweet sound that it is a perfect way to wrap up this project, which I thoroughly enjoyed listening to from beginning to end. There is a little something for everybody on this San Francisco Music Club release, so if you are looking for an album where every song sounds the same, this is probably not your best choice. But, if you can appreciate twelve tracks that showcase fine songwriting and musicianship and leave you feeling better than you did before you listened to them, Love and Freedom might be just the ticket. Earlier this year, as I sought shelter from a muggy summer evening in a Kansas City pub, I had the good fortune to hear Danny McGaw and his band for the first time. The quality of the musicianship and the lyrics coming from the stage were striking, and I am happy to report that Danny has released his Eccles Road CD so the rest of you can hear his music too. Danny grew up outside of Manchester England with aspirations to be a football player (soccer, as we know it in the States), and had started playing professionally when an injury permanently took him out of the game at the age of 18. The end of this dream was a blessing for the rest of us, as he started his music career in earnest, traveling to Isle of Jersey where he wrote music and played in bars. Eventually he moved to the U.S. where he travelled the left coast, playing shows and selling his CDs, until he moved to Kansas City in 2008. He started his own studio there and over time has managed to become a full-time musician, which might even be more difficult than becoming a professional athlete. 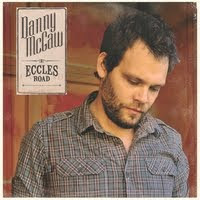 Eccles Road is his ninth CD (the others are all out of print), and Danny wrote all of the songs and produced it himself. He recorded it with the assistance of Sam Platt, and mixed and mastered the project on his own. During the seven months of recording he used a few different venues to get the best sounds, including an isolated old farm house for the electric guitars and a room with high ceilings for the drum tracks. Much of the rest of the material was recorded at his home in the city. On this album you will hear Danny McGaw on vocals and guitar, Dan Hines on bass, John Garofalo on guitar and Sam Platt on drums. This tight band works very well together, which is plainly obvious from the album as well as their live show. Danny did a wonderful job of putting this project together, and apparently he has figured out how to make a good album over the past few decades. Eccles Road refers to the street he grew up on, so it is not surprising that the first track, “These Streets” has a very personal and familiar tone to it. Danny describes his work as “modern folk music” and I am not going to argue with him as the songs certainly tell a story well, but I also hear the basic building blocks of blues, rock, and soul. You will hear that his voice is unique, with just a touch of an accent that makes his tone and phrasing more interesting. The mix is good, as sound of the instruments and vocals are consistently clear and well balanced. ”Hunted” is the next track, and it is a heavier blues rock tune with a melodramatic tale of a man on the run. We hear a prettier side of Danny’s voice in this song, and as he also effectively uses harmonies in the chorus. Hines’ bass parts really cut through on this track and compliment the different guitar parts in the bridge. This leads straight into “Kansas,” which has a lot of country sounds to it (though still rocking) as it describes the Midwest from the point of view of a man who knows what he is talking about. There is also a nice folk song, “Lovers on the Mend” that has a simple sound to it due to its sparse instrumentation of mostly banjo, acoustic guitar and piano. This background draws the lyrics and story to the forefront, making this is my favorite track on Eccles Road. McGaw has compiled his songs so that the genres and tempos are always changing, preventing the listener from becoming complacent. For example, “Man in the Wall” is an uptempo rock tune with a somber tone that comes before “Colors” which is a pretty blend of folk and bluegrass. After this we get to hear “The Dream has Grown” which starts with some funeral home organ, but quickly moves into an almost pop-like song. These transitions were not a slap in the face, but rather kept me interested in what was going on and helped me focus more on his lyrics. The last track is “Human Family” which was a wise choice. This is a mellow track with nicely picked acoustic guitar, harmonica and maybe some mandolin. The music fits well with the sobering message of the song and provides something for the listener to think about as the album comes to an end. As a whole, all ten songs are accessible and radio-friendly, with running times between three and five minutes each. I have played this CD quite a few times and have not found myself tiring of it, which does not happen often enough. With the quality of the music and production on Eccles Road, I can say with certainty that this is not the last we will hear of Danny McGaw. I do not consider myself to be a big Bruce Springsteen fan, and have never seen him perform in person. However, I do have a lot of his music in my collection and think that his recent Wrecking Ball album is some of the fines work he has ever done. So, these things led me to the Honda Center in Anaheim California this past Tuesday, so I could finally get a chance to see his live show and it was quite a bit better than I had ever dreamed it could be. There was no opening band, just Bruce Springsteen and his E Street Band. There were a few guest stars, but more on that later. He was joined on stage by the usual suspects: Nils Lofgren on guitar, Gary Tallent on bass, Mad Weinberg on drums, Little Steven on this and that, Roy Bittan on keys, an assortment of other characters on horns, percussion, fiddle, and lastly, Jake Clemons on the saxophone. He is Clarence Clemons’ nephew and is a very good player, but man oh man those are some big shoes to fill. By the way, Patty Scialfa was nowhere in sight. The show was supposed to start at 7:30, but the usher told me 8:15 and the band did not come on until 8:30, and by then the crowd was really ready. I have seen plenty of major acts over the years, but I have never heard a buzz or felt the excitement of the crowd like I did when Bruce came on stage. I imagine that this must have been what it was like when Elvis would come on stage, because his fans are rabid and love love love Bruce. The lady in the seat next to me told me that she had seen over 300 of his shows, and I believed her. I could never do a bad review of this show, because his fans would hunt me down and kill me. Fortunately I do not have to give a bad review because he really puts on a show! I know he is in his early sixties, but he has the energy and stamina of a man half his age, and he plowed through a 3 ½ hour show (no intermission) with gusto. His voice is as strong as ever, and his guitar and harmonica chops are quite impressive. 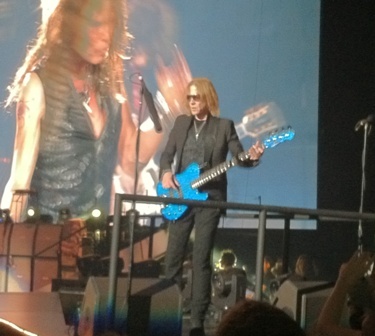 Plus, I noticed that he did not use Teleprompters, unlike Aerosmith and Rush, who I also saw in the past month. I don’t know how he can remember all of those lyrics and chord changes. They left the lights up for the first song, “The Land of Hopes and Dreams,” and thanks to his distinctive posture and movements I instantly recognized that Tom Morello was on stage too. The Rage Against the Machine guitarist collaborated on Wrecking Ball with Bruce, so I guess it is not a big stretch that he would drive across town to join in for the show. He was on and off the stage during the evening, and probably played on 5 or 6 of the 28 songs that the band performed that evening. Anyway, it was apparent that Bruce loves connecting with his fans and he worked the crowd like the professional that he is. He told some funny anecdotes, shared his feelings on the loss of his friend Clarence, and the recent destruction of his beloved New Jersey coastal community. Fortunately he never turned political and preachy, which is the last thing I want when going to a concert to have a good time. Springsteen walked out into the floor crowd and then jumped out and let them carry him around. The Boss would read the posters his fans brought, and collected a few and then took requests. He played a perfect solo acoustic version of “Long Time Comin’” and the rest of the band joined him for “Reason to Believe.” My god these guys are a tight band and their professionalism shone through in everything they played. Another local guest performer showed up and gave a rousing rendition of Social Distortion’s “Bad Luck.” And that would be none other than Mike Ness from Social D, which I don’t think is a twist that anybody saw coming. 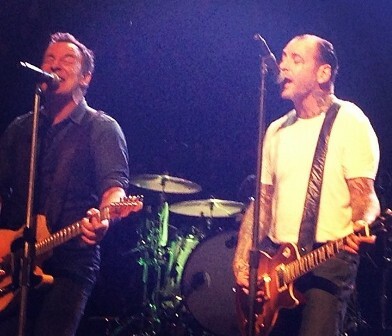 It is a sign of how important that Bruce and his music are that he is joined onstage by such diverse guest musicians. The the time the set ended with “The Ghost of Tom Joad,” “Badlands” (both with Morello) and Thunder Road, I was exhausted. But there was a little bit more to come. For the encore, Bruce Springsteen and the E Street Band cranked out “Jungleland,” “Born to Run”, “Dancing in the Dark,” “Santa Claus Is Coming to Town” and “Tenth Avenue Freeze-Out.” This would be almost a whole set for another band, but it was business as usual for these guys as they did these songs just as strong as their opener. Though I went into the concert with no real expectations, I have to say that now I understand what his fans are saying, and that Bruce Springsteen is truly a living legend and the poet of his generation. Every musician and music fan needs to see one of his shows, so they can see how great a show can be. On Monday night I headed out to the Staples Center in Los Angeles to catch The Global Warming Tour which has two bands I have seen before: Cheap Trick and Aerosmith. I last saw Aerosmith maybe ten years ago in Atlanta and Cheap trick more than fifteen years ago in Irvine, and they were both in their prime from at the time. So, I wondered how these two groups have stood up to the test of time, and it turns out that they are still doing pretty well! 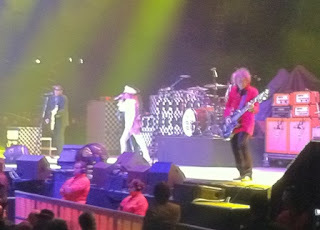 Cheap Trick kicked things off at 7:30 in the evening with “Hello There,” and when I saw Robin Zander wearing a bedazzled ice cream man suit (with a hat, even), I figured they must have hired David Lee Roth to be in the band, but it was just an optical illusion. They went on to blaze through a dozen more songs in their allotted hour, and as expected they managed to throw a few surprises into the show. I think they have a different set list each night, and they always throw a few cool covers into the mix. This evening they did The Move’s “California Man, and The Beatles’ medley of “Golden Slumbers,” ”Carry That Weight” and “The End.” These songs proved beyond a doubt that Zander still has his singing chops. Aerosmith loaned them keyboardist Russ Irwin for the Beatles’ songs, which was a really nice touch. Thankfully they did not do the hackneyed ballad, “The Flame,” but at the end of the show they played their biggest hits, including “I Want You To Want Me,” “Dream Police” and “Surrender.” They hit the ball out of the park on these, and did a great job of warming up the crowd, who came spilling back in for these last three songs when they heard what was going on. 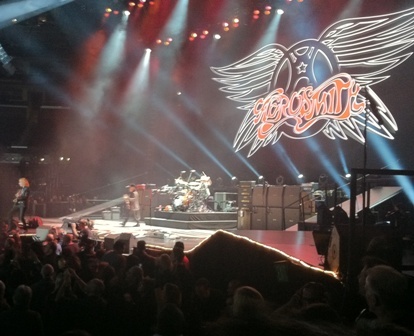 Brad Whitford from Aerosmith joined them on stage for “Surrender” – cool! Cheap Trick had one notable personnel change: Daxx Nielsen (Rick’s son), was on drums, although their website still lists original member Bun E. Carlos as being in the band. Daxx plays the drums very well, by the way. The rest of the line-up is the same: Robin Zander on vocals, Tom Petersson on his terrible sounding 12-string bass, and Rick Nielsen on guitar (and mugging about the entire time like he is still in junior high school). While the crew tore down Cheap Trick’s stage the crowd got to watch some handicam footage from backstage, which was a little confusing at best., and then things got going after a commercial about how great the new Aerosmith album is. Does this crowd really need this? Anyway, Staples Center was packed at this point, and the masses were treated to a rousing rendition of “Toys in the Attic” which led straight into “Love in an Elevator.” It was nice they gave us two of their big hits right out of the box, and the band was in good form and Tyler’s voice is still strong, despite the fact that they are all getting pretty old. One downer was that Perry’s guitar was way too quiet on these songs, but they got it fixed for the rest of the show. Things went about as expected from there, with a mix of music more heavily slanted toward their previous work than their new album (which is pretty good, actually), and the band did a nice job of having video coverage on the screen behind the stage so that everybody could see what was going on. Tyler, Perry and Hamilton did a good job of working all parts of the stage, including the catwalk that extended all the way to the center of the arena. Whitford pretty much stayed put and never made it to my side of the stage. They finished up their set with “Walk This way”, and for the encore they dusted off “Dream On”, “Mama Kin” and “Come Together.” Former Guns ‘n Roses rhythm guitar Izzy Stradlin joined in for “Mama Kin,” which surprised me even more than the Johnny Depp thing. All in all, it was one heck of a show, and the crowd was really great (bonus celebrity sightings: Gene Simmons and Shannon Tweed). Granted, these guys all look terrible, as 40+ years in the rock and roll world is an eternity, but they are still rocking like madmen. Check out their Global Warming Tour when it hits your town – it is sure to be a fun-filled evening! For live performances I have exclusively used Yamaha mixers for the past five years and have been very happy with their performance. These include a Stagepas 500, a MG102C and a MG124C, all of which have done exactly what they were expected to do. 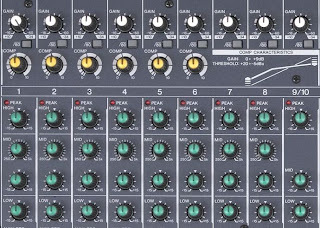 But a few times recently I have needed a bit more than any of these could offer (such as additional XLR inputs and more busses), which is where the Yamaha MG166CX comes into play. 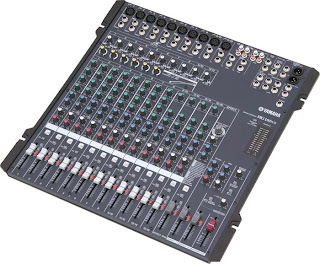 Yamaha markets this as a 16-channel mixer, but it only has 10 XLR inputs. And two of those XLR inputs are also stereo line inputs, so the company counts those as 4 inputs, and there are also two other pairs of stereo line inputs without XLRs. So, if you add these all up, that equals 16 channels in their world, even if 6 of them are paired up so that you cannot adjust levels separately. 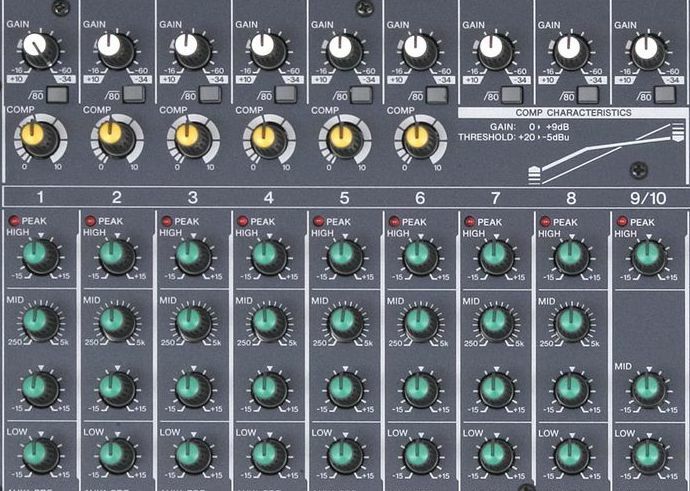 So, it is really a 12-channel mixer in my world. Other inputs include RCA jacks on channels 9/10 and 11/12 and 2TR so an iPod or CD player can be run through the board. 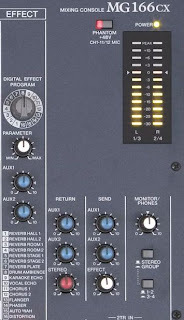 The XLR inputs each have their own preamplifiers, and there is one switch that turns on phantom power for all of them. 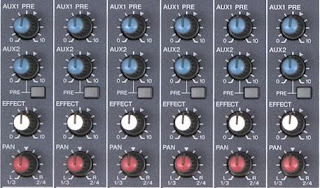 There are compression pots for the first six mono input channels, and gain controls with high pass filters for all ten of the microphone inputs. 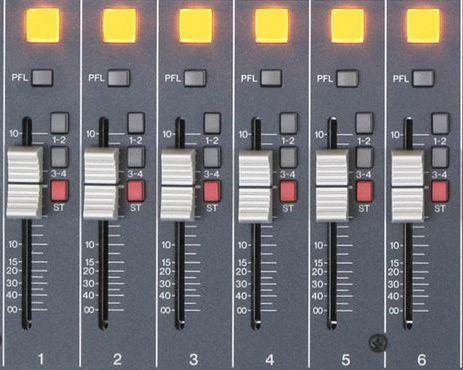 Every channel gets a 3-band equalizer, and channels 1 through 8 have level controls for the mids. 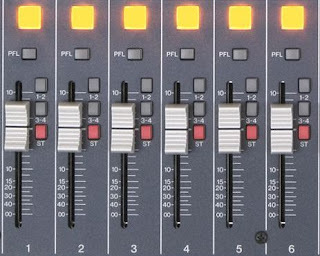 Thoughtful touches for the input channels are the inclusion of illuminated channel ON/OFF switches that let me add or drop channels from the mix without having to move the channel faders. There are also dual AUX send controls for each channel, one switchable for pre- or post-fader operation, and one fixed for prefader send. Lastly there are separate assign switches to add or remove channels from the stereo out or group 1-2 or 3-4 out. There are quite a few options for outputs too. For the main stereo out there are XLR and ¼-inch outputs. There are also two ¼-inch monitor outs, as well as separate outputs for groups 1, 2, 3 and 4. This really improves my ability to give everybody what they think they need through the monitors. 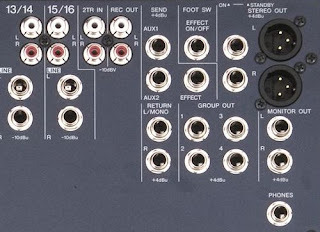 Oh yes, and RCA outputs in case you would like to record whatever you are doing, and even a headphone jack. Locating all of these inputs and outputs on the top of the unit really make setting things up easier and allow much faster midstream changes. 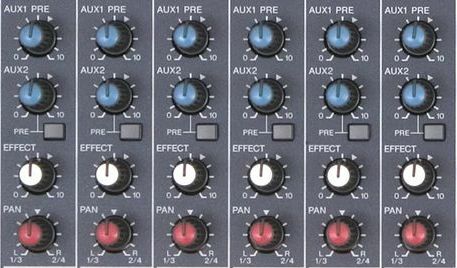 Like other MG-series mixer, the MG166CX has individual compression controls, in this case on channels 1 through6. 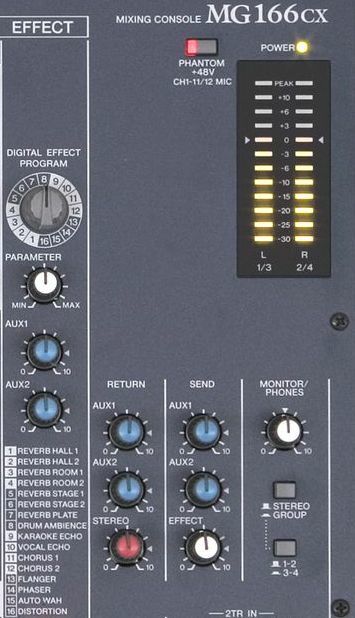 But as there is an X in its name it also gets Yamaha’s SPX digital effects knob. 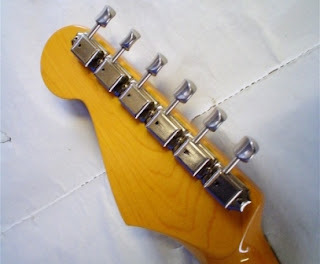 This includes a selection of 16 different effects, and since there is only one knob you can only use one of them at a time. Most of them are kind of lame, but sometimes it is nice to add a little reverb. You can control the amount of effect that is applied to each channel through individual level pots. This is a standard sized mixer that fits 12U mixer cases (which are the ones that are usually set into the top of 19-inch wide rack road cases) or into the SKB gig rack which I will be reviewing sometime on this blog. It has a solid feel but weighs in at only 12 pounds, so it is not too porky. The Yamaha MG166CX works very well in my world. It sounds good with no added noise and it is versatile enough that I can use it for most live sound situations. The channel ON/OFF switches are a godsend, as well as the assign switches for stereo and groups 1 /2 and 3 / 4. This helps keep everybody on the stage and in the audience happy. It is a winner in my book! To wrap things up here, I have to say that this unit is the best performer and the best value in its class. 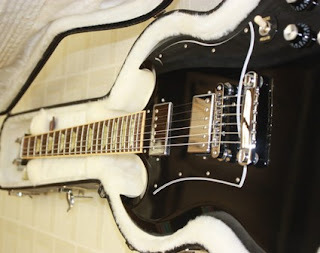 The MG166CX has a list price of $549 and a street price of $409.99. 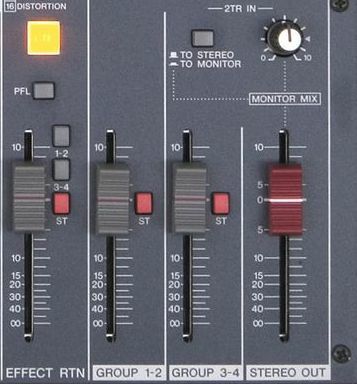 You are not going to find a better non-powered mixer for the money.